Could anyone have guessed that a posh Buckhead family would be the ones to roll out the city’s first gourmet Korean taco truck? I met Rebecca Young, who runs Rebecca Boutique on Cains Hill Place, last year when I started organizing meetings to jump-start the kind of vibrant street food scene in Atlanta that already thrives in cities such as New York, Los Angeles, and Portland, Oregon. Rebecca had done research on the subject with her son, Carson, a handsome graduate of Woodward Academy and Ole Miss who doesn’t let the fact that he is deaf interfere with his social or professional life. Carson accompanied Rebecca on buying trips to Los Angeles: Rebecca would shop for merchandise, while Carson would drive around and explore the city’s gourmet food truck culture. He finally took his mom to the famous Kogi truck that serves Korean tacos. They looked at each other as they devoured lunch and agreed: Carson should introduce this experience to Atlanta. Every young man should be so lucky to have parents willing to help at the start of his career. Enlisting the aid of Carson’s lawyer dad, Hillyer (he and Rebecca are divorced but remain close), the family researched legal issues and licensing. Then they read a review of Hankook Taqueria in which I bemoaned the isolated location, far up Collier Road, chosen by chef-owner Tomas Lee. “Give that man a truck,” I wrote. When approached, Lee was immediately interested in partnering with Carson. “He was so motivated,” Lee told me. “I wanted to help him.” Hankook started to double as a commissary kitchen, supplying the food for the Youngs’ new mobile unit. The truck was baptized Yumbii Far Out Food. It parked on Spring Street at Tech Square for two weeks in August, but because of permitting issues, it currently operates on private properties, such as at Buckhead’s Prominence office building, as well as permitted events and festivals. The marinated grilled meats and special sauces for Yumbii’s Asian-Mexican-Southern menu are prepared by Hankook staff and loaded onto the truck. The final assembly of the tacos, burritos, quesadillas, sliders, and sometimes hot dogs takes place in the truck’s compact and incredibly tidy kitchen. 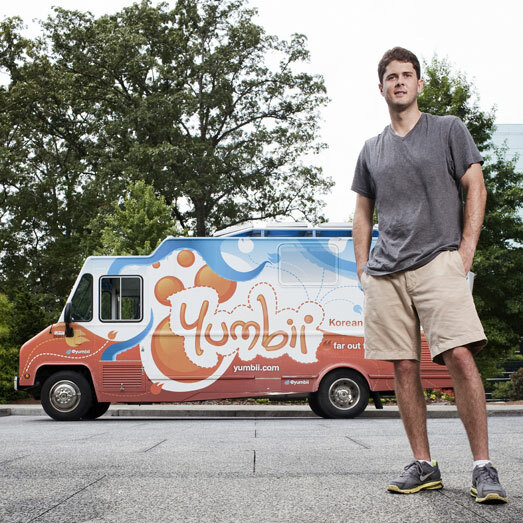 When Carson pulls the Yumbii truck into the parking lot of the Sweet Auburn Curb Market or another regular stopover, there is typically a line of people already waiting, the result of timely updates on Twitter.